The Al Wusta site in Saudi Arabia is surveyed and mapped. Archaeologists say that modern humans left Africa and lived here at least 85,000 years ago, when the region was a grassland with freshwater lakes and rivers. Four views of the fossil finger bone from Al Wusta in Saudi Arabia. Scientists say it belonged to a member of the Homo sapiens species who lived about 88,000 years ago. The bone itself is about 3 centimeters long and less than 1 centimeter across. 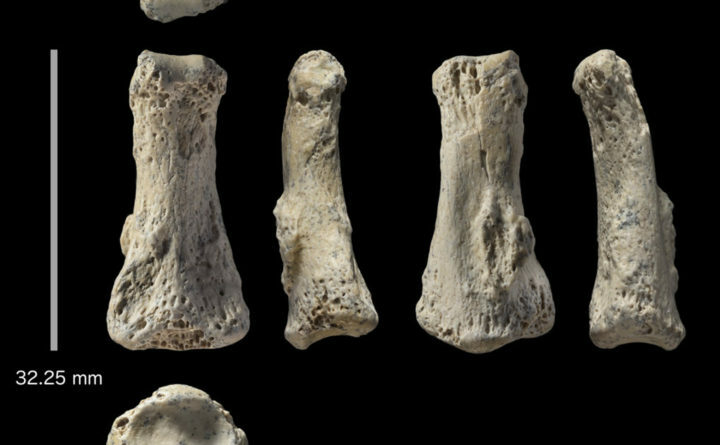 The 85,000-year-old finger fragment was about as big as a Lego — but the archaeologists who found it buried in the Saudi Arabian desert say it’s among a slew of recent discoveries that may challenge our understanding of how early humans first migrated out of Africa. Archaeologists from the Max Planck Institute for the Science of Human History in Germany announced the discovery of the fossilized finger earlier this month. They described it as the oldest directly dated Homo sapiens fossil found outside of Africa or the southwest Asian region called the Levant, or modern-day Israel and Syria. The finding — published April 9 in the Nature, Ecology and Evolution journal — “joins a small but growing corpus of evidence” suggesting humans may have migrated from Africa much earlier and farther than previously thought, the archaeologists said. The “textbook theory” about migration from Africa is that Homo sapiens didn’t move on until about 60,000 years ago, mostly in a single wave of migrants along the African coast, Huw Groucutt, the article’s lead author from the University of Oxford’s School of Archaelogy, told The Washington Post. If they did leave Africa, he said, scientists theorized they only made it to the Levant, often called the doorstep of Africa, where it meets the Middle East. But a series of findings over the past decade, including this one, have begun to challenge that theory. In recent years, archaeologists in China have made several discoveries in three separate caves, finding teeth and a jawbone believed to be between 80,0000 and 130,000 years old and believed to belong to humans. In 2015, archaeologists dug up 65,000-year-old human relics, such as stone tools, in Australia, challenging the belief that humans did not migrate there until about 18,000 years ago. And in Israel, archaeologists found a jawbone believed to be at least 177,000 years old. Groucutt said the discovery of the fossilized finger builds on these discoveries, and also argued that his team’s direct dating methods made this discovery the most reliable. The finger bone was dug up in Saudi Arabia’s Nefud Desert at a site called Al Wusta in 2016. Tens of thousands of years ago, this arid region used to be home to lush grasslands and freshwater lakes, possibly created following enhanced monsoonal rainfall that made the otherwise “formidable barrier” more habitable for humans and animals, according to the article. Before finding the human bone, the archaeologists also spent years digging up hundreds of stone tools in the area as well as bones from hippopotamuses, wild cattle and African antelope — all animals that no longer exist in today’s desert climate in that region. Ordinarily, finding a preserved, ancient human bone in the middle of a desert would be akin to finding Waldo in the middle of Manhattan from 30,000 feet up, in the fog. But Groucutt said that the bone was likely preserved thanks to the ancient lake. The digit was buried in its sediment. According to the article, the bone was dated using uranium series dating and found to be at least 85,000 years old. The sediments where it was found were also tested and found to be about 85,000 to 90,000 years old. The bone was also closely compared to bones from primates and Neanderthals to rule out the possibility it did not belong to a human. Other archaeologists not involved in the research have backed up Groucutt’s team’s methodology, while at least one cautioned to the Smithsonian that it may be too soon to say with certainty that the finger bone belongs to Homo sapiens given that its shape possibly overlaps with other species. Many expressed confidence that the bone fit in with other evidence suggesting the long-held theory of migration from Africa — often referred to the “Out of Africa” theory — is more complicated than previously believed. 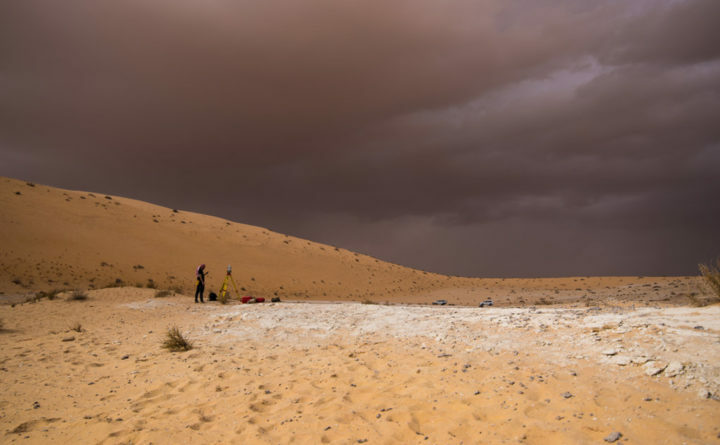 Groucutt said that his team intends to continue digging in Saudi Arabia, where vast areas remain unexplored. Archaeologists whose findings may challenge the “Out of Africa” model, he said, are still in the “very early days” of their discoveries, and too many questions remain unanswered before a new model can convincingly replace the existing one.